Macchi’s work arises out of anecdote, chance and daily life, and is characterized by an attention for the unexpected and for the stratified disclosure of the everyday and its different levels of meaning through a profound sense of alienation. To heighten the tension between our log- ical understanding of the world and the emotive and sensorial experience we have of it, the artist employs a wide range of media. The specificity of the support is of central importance in his practice. In this show Macchi focuses on painting. 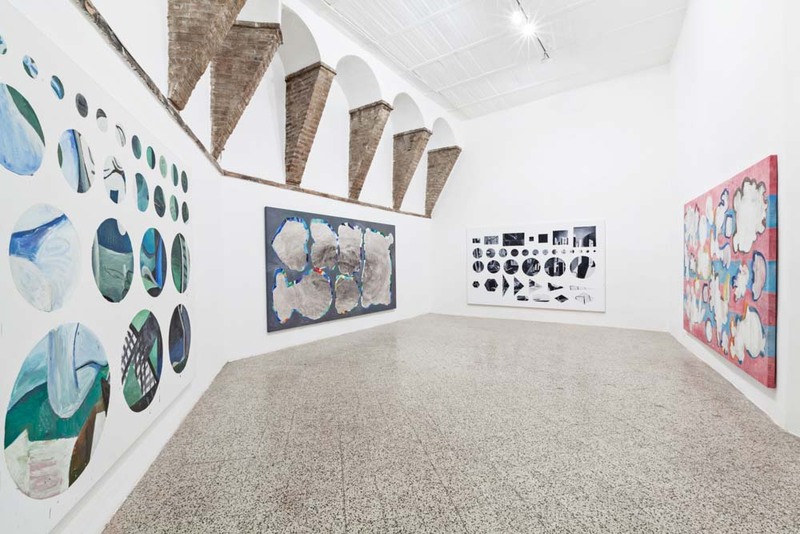 The exhibition comprises large oil paintings on canvas, interrupted images where geometric figures compete with a back- ground that always remains indecipherable and fragmentary. Produced by the artist in the course of 2013, these works form a complex system of obstacles and deviations, bringing into play the contradiction of sensorial experience they offer and the expectations of visual culture. Through his parsimonious and at times anti-iconic pictorial style the Argentine artist gives us his own “vision of the world”. Circles, rectangles, triangles, surfaces, niches, fragments and cuttings capture our gaze. In these pictures the undefined object is carefully elaborated and developed. The elements that make up Macchi’s paintings refer to a visual modality inherited from the history of painting. However, it is impossible to find any continuity in the technical and iconographic content, so much so that their significance is in some way concealed. Macchi produces hard-to-classify visual motifs that suspend the representation in order to create a new form of relationship with the viewer. The artist insists on a vision of painting as the receiver of a difficulty that does not end with the simple interpretation of the signs. Macchi traces a path made up of deviations and negations, and his interlocutor is called upon to play an active role, because the comprehension of the work can only occur through time, reflection and contemplation of the image. France (2001); The Wandering Golfer, Museum of Contemporary Art Antwerp (MUHKA), Belgium (1998). The artist has contributed to group shows at the Hammer Museum in Los Angeles, USA (2011); Kunsthalle of Mulhouse, France (2010); Museu de Arte Moderna, São Paulo, Brazil (2009); Daros Collections, Zurich, Switzerland (2008); Walker Art Center, Minneapolis, USA (2007); The Drawing Center, New York, USA (2001), and also to various Biennali: Liverpool (2012), Lyon (2011), Auckland (2010), Yokohama (2008), Porto Alegre (2007), São Paulo (2004), Istanbul (2003) and Havana (2000). In 2005 he represented Argentina at the 51st Venice Biennale. He has participated in artist’s residencies in Germany, the United States, France, Italy, Holland and England.